Eight August days of searching for a small whitish worm in Greenland (see previous post “Greenland enchytraeids”): Decaying seaweed is a unique habitat and there are several species of enchytraeids other than Enchytraeus albidus at the collecting sites, most of them of the genus Lumbricillus. Being a taxonomist of enchytraeids, I took the opportunity to study them using laboratory facilities kindly provided by staff of the GINR, the Greenland Institute of Natural Resources, in Nuuk. This particular worm was similar to E. albidus but seemed somewhat too large, and in fact it turned out to be a different species, Lumbricillus reynoldsoni Backlund, 1948 – a new species record for Greenland. The streak in the middle is the gut. The big bodies on both sides of it are glandular sperm funnels, and the iridescent bodies on top are nuclei of mature spermatozoa aligned in parallel. These structures are crucial to recognize the species. Fortunately, all adult individuals have the same structures because enchytraeids are hermaphrodites, like earthworms. This small species is similar to Lumbricillus buelowi Nielsen & Christensen, 1959, not yet recorded from Greenland. Among hundreds of specimens I found only two individuals. All in all, six species of Lumbricillus were identified; the most abundant ones were species common in the Palearctic: L. rivalis, L. lineatus, L. pagenstecheri, L. viridis. Two species, L. reynoldsoni Backlund, 1948 and L. cf. buelowi Nielsen & Christensen, 1959 (see pics above), are rarely collected and in fact are new species records for Greenland. The pic below shows the results of some hours of microscopical identification work: worms in the same dish belong to the same species, and they are all still alive. Only the one top right is E. albidus, the other ones are different species of Lumbricillus. Worms were later fixed in 100% ethanol for genetic studies or in hot Bouin’s fluid – a nasty mixture of picrinic acid, formaldehyde and acetic acid – for morphological studies. These worms are now in Spain, where I live and work, and they will be investigated taxonomically at the CICA, a new research facility at the University of A Coruña. Worms in Århus are happier, still alive, and will be submitted to cooling and freezing in order to unravel the genetics of their cold tolerance capacities – but this is another story. A dream came true for me this summer: to study the fauna of Greenland. Is there anything more exciting for a zoologist to observe free wildlife in vast Ice Age areas … polar bears, humpback whales … ? Yes there is, if you are a specialist of enchytraeid worms: to fumble in decaying, stinky seaweed on the shore, to search for one specific species of small, slimy, whitish worms – and then to find it by the thousands. Seashore in Nuuk. E. albidus is found in and below the uppermost dark-brown layer of decaying seaweed. Its name is Enchytraeus albidus – the “compost potworm” – a species of small oligochaete worms of the family Enchytraeidae. They are relatives of the earthworms. E. albidus occurs abundantly in decaying seaweed on the seashore. It is easily maintained and reared in the laboratory. 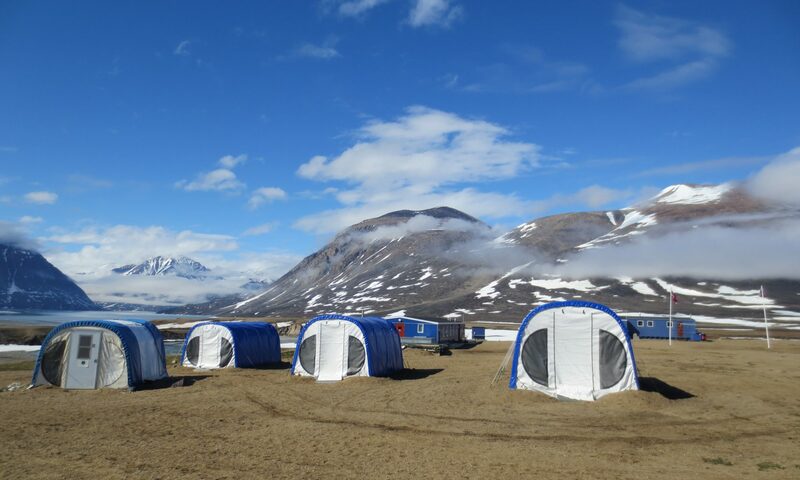 The species is being sampled this summer at numerous places in the Arctic and further south to obtain populations from different climatic regions (Interact project GENEFREEZE). Later on, the genetics of cold tolerance of this species will be investigated, comparing the gene expression patterns of the different populations. My part was to find the species in Greenland around Nuuk and Kobbefjord and to send living populations to the University of Århus, where the experiments will take place. Picking up Enchytraeus albidus worms amidst a beautiful scenery and thousands of flies. A stone that was embedded in sandy sediment below rotten seaweed, turned downside up. Dozens of enchytraeid worms are crawling on the moist surface. The white worms are Enchytraeus albidus. Most of the worms here are rose in colour, and belong to species of another genus (Lumbricillus sp.). Beakers with original sediment from different collecting sites, each containing a subpopulation of ca. 200 E. albidus worms, to be shipped. Worms were sampled either directly in the field, or from substrate carried to the laboratory of GINR, the Greenland Institute of National Resources. I picked them up from the substrate with featherweight forceps or the naked finger, or by submerging the sample in a dish filled with seawater: worms would emerge from the substrate with typically winding body movements and could be taken up with a plastic pipette. They were placed in about 200 gr of original sediment sample and kept cool before shipping to Århus University.